He'd been on the pitch a matter of minutes when Paul Sharner said something, seemingly, out of turn to him. Never one to take things that little bit too far, Big Dunc turned around and punched, no welleyed, Shcharner right in the stomach. Or the bread basket to all you WWE fans! The beauty of the whole incident was that the punch actually lifted Scharner off the floor. A better dig has surely never been witnessed on a football field. 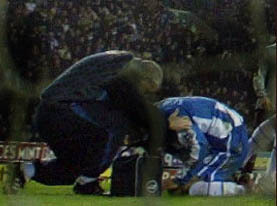 Scharner looks for his small intestine on the JJB pitch. At the time there were cries of ‘disgrace' and ‘he should never pull on the blue shirt again'. And some readers probably think it out of order to make light of such a violent incident, indeed, the fella was jailed for less. But I don't care because that was part of his make up and something we all, at least secretly, loved about him! For the record, he was sent off for that punch and received a further red card for pushing the ludicrously named Pascal Chimbonda in the face. To my knowledge, he is the only player to have been given two red cards in one match. A fitting epitaph dontcha think?! At least he only had to walk off the once!